The first day of Adobe’s Max Creativity conference offered a treat. An Apple event late in the afternoon encouraged a group of guests to try out Adobe’s brand new Photoshop Fix and some of its other mobile apps on the upcoming iPad Pro. I experienced first-hand what touching up photos might be like on the giant table — alongside Apple’s new pencil. While the 12.9-inch iPad is much larger than the latest iPad Air 2, it’s first and foremost a creation device. Most people in the room were trying it out as it lay flat on a table, rather than attempting to pick it up and hold it. For creating comps and sketches and editing photos, I suspect that will continue to be the case. While I had no problem propping up the tablet, I would not have wanted to hold it aloft for a long period of time. The pencil is light, thin and easy to hold, letting you choose precisely among Fix’s slate of commands and making it easier to make changes to your picture. I had no complaints about performance. Photoshop Fix works swiftly and smoothly on the iPad Pro, just as it did on my own devices. Moreover, the idea that we can ditch mice for certain artistic workflows is appealing. “It’s exciting that Apple has built the Pencil with the iPad in mind to work perfectly,” Macy said. Despite that Adobe already introduced a new pen last year, Macy says there were ongoing talks between Apple and Adobe around the concept of a pencil as Apple sought to deeply integrate it with the new tablet. 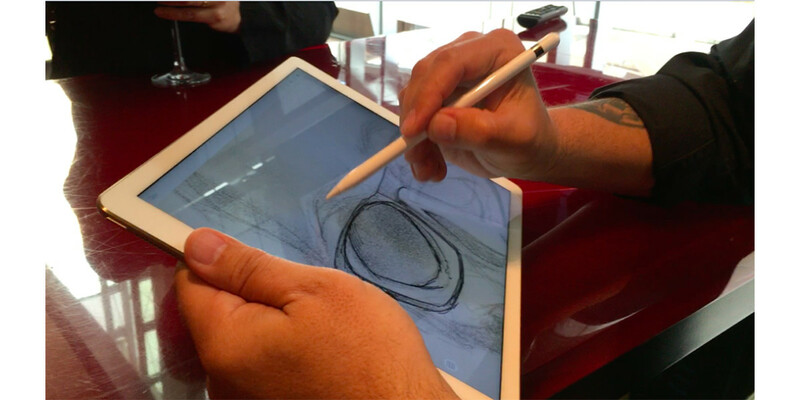 From Apple’s perspective, the pencil tech is built into the tablet. Whereas other styluses are made to imitate the finger, the functionality of the pencil is derived from the tablet, letting its built-in sensors detect position, force and tilt. Conversely, with the successful launch, Adobe is now looking for ways to improve the app. “There’s things around working with your assets that might be in Dropbox or Creative Cloud where we can make sure that we remember where you were, that we give you flexibility around when we send to photoshop on the desktop, or where to store files,” said Manu Anand, product manager for Photoshop Fix. “We’ll continue to do a better job on skin smoothing, color, masking and lighting,” Anand said.